Helmets should be included in ski hire packages to protect against head injuries, say researchers in the British Medical Journal. University of Innsbruck sports scientists say research has shown ski helmets reduce head injuries by 35% in adults and 59% in children under 13. Awareness of brain injuries from accidents could also increase helmet use, they argue. But some instructors think they are unnecessary. Austrian researchers from the Department of Sports Science at Innsbruck looked at a number of past studies in this area to inform their view. They found that between nine and 19% of all skiing injuries reported by Austrian ski patrols and emergency departments are head injuries - and severe head injuries, including traumatic brain injury, are a leading cause of death in winter sports. Another study found that adults and children, of all ages, wearing a helmet while skiing were significantly less likely than those without a helmet to have a head injury. Thus the researchers concluded that, "wearing a ski helmet seems to make sense to prevent head injuries in all age groups". Other studies found that 74% of head injuries occurred when skiers hit their head on the snow, 10% when they collided with other skiers and 13% when they collided with fixed objects. This suggests that "protecting the head with a helmet must be beneficial", the researchers say. Gerhard Ruedl and colleagues at Innsbruck also tackle the theory that helmets impair hearing and reduce a skier or snowboarder's field of vision, but are not convinced by the arguments. There is another point of view that wearing a helmet could provide a false sense of security and encourage more risky behaviour on the slopes. But since studies show that helmet use is higher in more skilled skiers, the researchers conclude that, "the use of a helmet is not necessarily associated with a higher level of risk-taking but primarily with a higher level of skill." Ultimately, they call for better education about brain trauma injuries and for the wearing of helmets to be made routine. Many countries and ski areas have decided to promote and encourage the use of helmets on the slopes. In Austria, for example, it is obligatory for children under 16 to wear a helmet when skiing or snowboarding. In the United States, where latest data shows that helmet use has risen to nearly 50%, some resorts have made helmets compulsory for their employees. A number of high-profile skiing accidents have had an effect. A mother of four children died on an Austrian ski run in 2009 when she collided with a German politician. The politician was wearing a ski helmet and survived. The woman, who was not wearing a helmet, suffered a fatal brain injury. Actress Natasha Richardson died while skiing in Canada in 2009 after a fall on a beginner's ski run. She also sustained a severe head injury and was not wearing a helmet. Betony Garner, spokesperson for the Ski Club of Great Britain, says that helmet use on the slopes has increased dramatically over the last few years. "Our view is that children under the age of 13 should wear a protective helmet and adults should use their own discretion," she said. Although many snowboarders wear helmets because it's seen as part of a snowboarder's attire and the design of helmets has become more streamlined, colourful and trendy in recent years, Ms Garner says helmets are still not for everyone. "There are still a big group of people who won't wear a helmet - experienced skiers and some ski instructors, because they are not used to it and just don't think it's necessary." 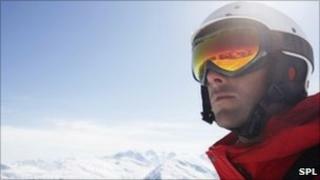 Should ski helmets be compulsory?